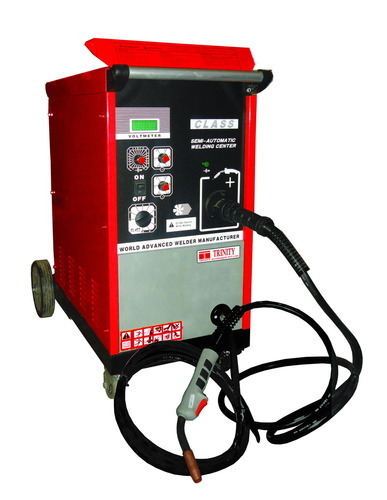 FY series MIG semi-automatic gas shielded welding machines are suitable for all position and highspeed welding of sheet metal and medium plate.Mainly used in welding of ferrous metallic materials such as low carbon steel,low alloy steel, high strength low alloy steels,stainless steels,steels, iron,aluminum and nickel,etc.With one piece design, Pulse Width Modulation(PWM) electronic speed control provides a high efficiency of wire feeding and a smooth and steady of wire feed speed during welding process.Adjustable welding and intermittent time is specifically designed for spot welding of sheet metal, easily and flesibly.Extensively used in the welding and field operation of steel construction,oil pipeline,car production,shipyard,industrial installation,etc. We are acknowledged in the market as one of the prime manufacturer, exporter, traders and wholesalers of an exhaustive collection Automobile Equipment. This range includes Wheel Aligner, Wheel Balancer Tyre Changer, Two Post Lift, Seizer Lift, Nitrogen generator and Fuel Injector Cleaners. In addition this, we also offer Engine Scanner, Paint Booth, Car Washer, Fault Code Reader (OBD Reader), Endoscope (End 2000) and Other garage tools. These products are known for reliability, safe use, easy maintenance and long term performance. We possess adequate knowledge and experience of the domain, which we put to judicious use for achieving all our targets. The support of our qualified individuals contributes further to the same effect. We encourage our procurement agents to obtain products from well-known manufacturers and vendors. This helps in assuring that the products comply with the standards of industry. Our quality unit inspects all procured items apart from the tests performed at vendor's end. We guarantee our clients that the products we offer are kept appropriately in our warehousing unit before delivery. Our efforts have allowed us to expand our market all around our country.